A modern and casual Mexican restaurant specializing in tacos --- including vegan-friendly --- from actor Danny Trejo. : Located along a busy stretch of La Brea Avenue is where you'll find this bright eatery that puts a clean, modern twist on the typical taco joint. Rows of shiny communal picnic tables topped with canvas umbrellas line the outdoor patio (seating here is mostly al fresco) while folks line up to give their order at the counter. 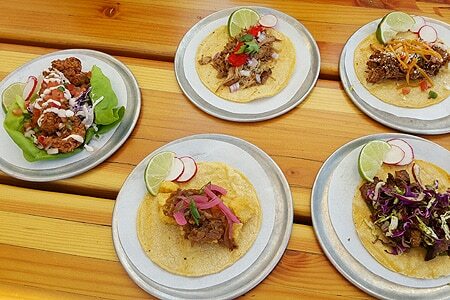 Built as an homage to actor Danny Trejo's late mother who always dreamed of having her own restaurant, Trejo's Tacos offers a variety of tacos for meat eaters, vegetarians, vegans and gluten-free foodies alike. Featuring locally sourced ingredients, the menu ranges from shrimp tostadas and cheesy bean dip to organic street corn, heirloom beans and tacos made with brisket, pork shoulder, fried chicken or black pepper tofu that can be rolled, bowled or served "Machete style" in a lettuce cup. The housemade agua frescas and kombucha on tap are a sweet way to wash it all down. As the man himself says, "Trejo’s Tacos is where everyone can find something they can enjoy."